Disclaimer: If you are expecting this post to end with a photo of an immaculate pantry with a fun-colored accent wall where all the food is stored in color-coordinated tins with cute, hand-lettered chalkboard labels and lit by a classy little chandelier, then you are in the WRONG PLACE! Nevertheless, I am super happy with how this project turned out and very grateful just to HAVE a pantry. Read on for a DIY shelving solution that is low-budget but high-function! When we moved into this house, we were thrilled to finally have a pantry! We did find it a little silly that the kitchen had a sizable walk-in pantry, while our first-floor master bedroom, which shares a wall with the kitchen/pantry, only had one small reach-in closet. We decided to wall-off a section of the pantry and add a door from the bedroom side, creating a second closet off the bedroom and leaving a smaller pantry off the kitchen. We hired a contractor for that work, and they did a lovely job matching the new bedroom door and flooring. Now we have very reasonably sized his-and-hers bedroom closets and a perfectly adequate pantry! We had to find shelving solutions for both our closets and our pantry. In the bedroom closets, we installed elfa systems from the Container Store. It's pricey, but it's really easy to install and by-far the most modular of any system I've found. We had it in Mae's closet in the old house and I was very pleased with it there. It took us several weeks to work on the pantry shelving. 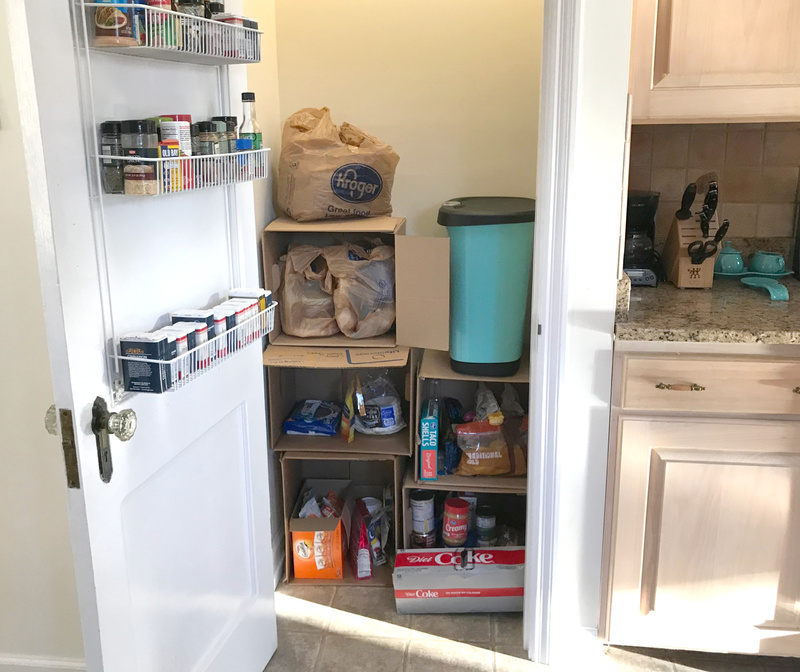 Putting an elfa system in the pantry didn't seem like the most efficient use of our space or money, so we searched the internet for some DIY shelving tutorials. In the mean time, we re-purposed an old bookshelf and some empty boxes as a storage solution. We decided to install melamine shelves resting on MDF 1x2s mounted to the wall studs. Dan bought all the supplies at Home Depot and had them make the cuts, so we wouldn't even have to get out the saw at home. We made sure to use a stud finder and only had to use wall anchors at one spot for each shelf. Mae looks so young in that photo! That was actually taken back in January when I was working on her room before we moved in. She liked the beeping stud finder. We screwed the 1x2s into the wall at the back and sides and then rested the melamine boards on top. The shelves are 12" deep, except for the top shelf which is 8". The heights vary from about 11" to 15" to accommodate different sized items. We ordered the hanging shelf baskets from Amazon to hold wraps and baggies. We are loving our new shelves. It would be super easy to beautify this if we want something a bit more aesthetically pleasing in the future. We could easily patch some screw holes, add a couple little trim pieces to cover gaps, and touch up the brackets and walls with paint. However, with all the other projects I want to do in this house, I definitely don't see a "pretty pantry" making it to the top of my priority list for quite a while!